Far across the solar system, from where Earth appears merely as a pale blue dot, NASA’s Galileo spacecraft spent eight years orbiting Jupiter. During that time, the hearty spacecraft — slightly larger than a full-grown giraffe — sent back spates of discoveries on the gas giant’s moons, including the observation of a magnetic environment around Ganymede that was distinct from Jupiter’s own magnetic field. The mission ended in 2003, but newly resurrected data from Galileo’s first flyby of Ganymede is yielding new insights about the moon’s environment — which is unlike any other in the solar system. The new results showed a stormy scene: particles blasted off the moon’s icy surface as a result of incoming plasma rain, and strong flows of plasma pushed between Jupiter and Ganymede due to an explosive magnetic event occurring between the two bodies’ magnetic environments. Scientists think these observations could be key to unlocking the secrets of the moon, such as why Ganymede’s auroras are so bright. In 1996, shortly after arriving at Jupiter, Galileo made a surprising discovery: Ganymede had its own magnetic field. While most planets in our solar system, including Earth, have magnetic environments — known as magnetospheres — no one expected a moon to have one. Between 1996 and 2000, Galileo made six targeted flybys of Ganymede, with multiple instruments collecting data on the moon’s magnetosphere. These included the spacecraft’s Plasma Subsystem, or PLS, which measured the density, temperature and direction of the plasma — excited, electrically charged gas — flowing through the environment around Galileo. New results, recently published in the journal Geophysical Research Letters, reveal interesting details about the magnetosphere’s unique structure. We know that Earth’s magnetosphere — in addition to helping make compasses work and causing auroras — is key to in sustaining life on our planet, because it helps protect our planet from radiation coming from space. Some scientists think Earth’s magnetosphere was also essential for the initial development of life, as this harmful radiation can erode our atmosphere. Studying magnetospheres throughout the solar system not only helps scientists learn about the physical processes affecting this magnetic environment around Earth, it helps us understand the atmospheres around other potentially habitable worlds, both in our own solar system and beyond. Ganymede’s magnetosphere offers the chance to explore a unique magnetic environment located within the much larger magnetosphere of Jupiter. Nestled there, it’s protected from the solar wind, making its shape different from other magnetospheres in the solar system. Typically, magnetospheres are shaped by the pressure of supersonic solar wind particles flowing past them. But at Ganymede, the relatively slower-moving plasma around Jupiter sculpts the moon’s magnetosphere into a long horn-like shape that stretches ahead of the moon in the direction of its orbit. Flying past Ganymede, Galileo was continually pummeled by high-energy particles — a battering the moon is also familiar with. Plasma particles accelerated by the Jovian magnetosphere, continually rain down on Ganymede’s poles, where the magnetic field channels them toward the surface. The new analysis of Galileo PLS data showed plasma being blasted off the moon’s icy surface due to the incoming plasma rain. 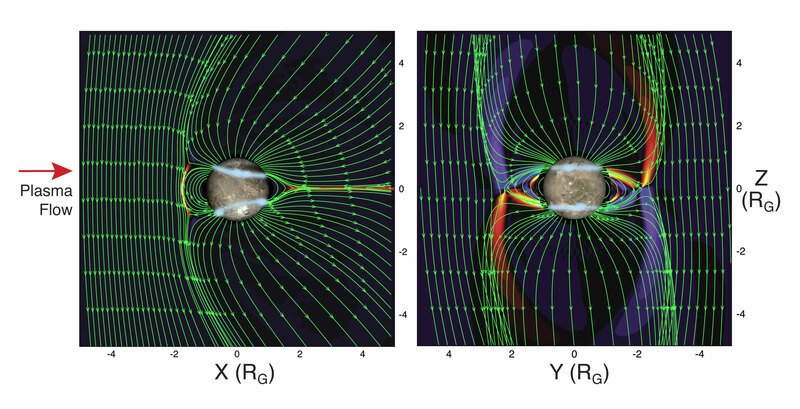 This visualization shows a simplified model of Jupiter’s magnetosphere, designed to illustrate the scale, and basic features of the structure and impacts of the magnetic axis (cyan arrow) offset from the planetary rotation axis (blue arrow). The semi-transparent gray mesh in the distance represents the boundary of the magnetosphere. Ganymede has auroras, or northern and southern lights, just like Earth does. However, unlike our planet, the particles causing Ganymede’s auroras come from the plasma surrounding Jupiter, not the solar wind. When analyzing the data, the scientists noticed that during its first Ganymede flyby, Galileo fortuitously crossed right over Ganymede’s auroral regions, as evidenced by the ions it observed raining down onto the surface of the moon’s polar cap. By comparing the location where the falling ions were observed with data from Hubble, the scientists were able to pin down the precise location of the auroral zone, which will help them solve mysteries, such as what causes the auroras. As it cruised around Jupiter, Galileo also happened to fly right through an explosive event caused by the tangling and snapping of magnetic field lines. This event, called magnetic reconnection, occurs in magnetospheres across our solar system. For the first time, Galileo observed strong flows of plasma pushed between Jupiter and Ganymede due to a magnetic reconnection event occurring between the two magnetospheres. It’s thought that this plasma pump is responsible for making Ganymede’s auroras unusually bright. Future study of the PLS data from that encounter may yet provide new insights related to subsurface oceans previously determined to exist within the moon using data from both Galileo and the Hubble Space Telescope. The research was funded by NASA’s Solar System Workings program and the Galileo mission managed by NASA’s Jet Propulsion Laboratory in Pasadena, California, for the agency’s Science Mission Directorate in Washington.